After weeks of wondering, I finally got an update on how Black Jack was doing in his new home. Or rather, his new new home. 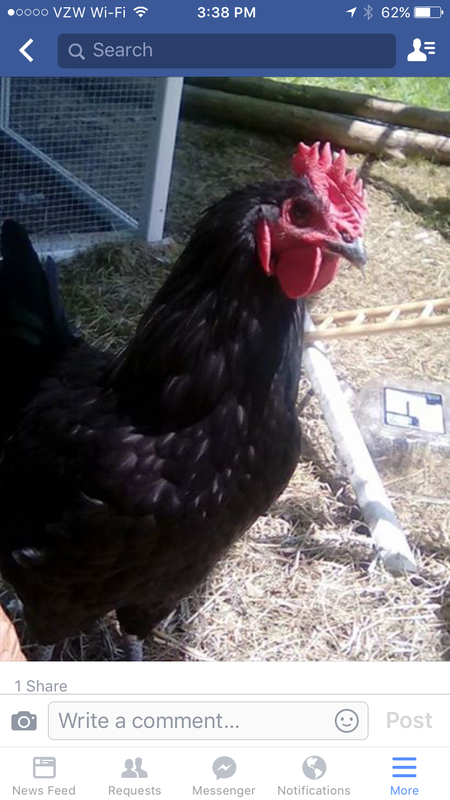 My friend, Barb, who took him for us several weeks ago, had to remove him for basically the same reason I wanted to find him his own flock – her established rooster very strongly disliked him at first sight. After weeks of trying,unsuccessfully, to integrate him, she asked a friend without a rooster if she would take him. Her friend has a young flock of Rhode Island Red pullets. No rooster. Her friend posted this picture today, and called it the best adoption she’d ever made. The coop behind him looks cozy and fun. He sings for her and is loved by his hens and his humans. And look how big and handsome he is!! He’s not my Black Jack anymore, but I’m so happy for him!